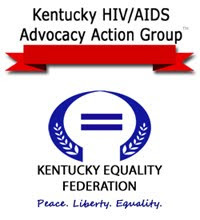 Lexington, KY – Two statewide advocacy groups, Kentucky Equality Federation and the Kentucky HIV/AIDS Advocacy Action Group today condemned House Bill 350 as ethically irresponsible and a crime against anyone living with HIV/AIDS. House Bill 350 seeks to remove HIV/AIDS training and education requirements for licensed service providers such as physicians, registered nurses, social workers, etc. Both organizations are opposed to the legislation because treatment options change rapidly, making it imperative that all health care professionals know the physical manifestations of HIV/AIDS. It is a matter of getting people in the proper care as soon as possible. This could be the difference in a healthy outcome or multiple misdiagnoses that would end up costing more financially either for the patient themselves or for the taxpayers of Kentucky. "Treatment options change rapidly, therefore physicians or other clinicians that do not treat HIV/AIDS as a specialty would be hard pressed to know the best treatment options for their patients infected with this disease," stated Bobby Edelen, president of the Kentucky HIV/AIDS Advocacy Action Group. Gary L. Fowler, a special adviser to the Kentucky HIV/AIDS Advocacy Action Group, and Co-Chair of the Kentucky HIV Prevention Advisory Council (KHPAC) stated: "I would like to point out that surveillance training is necessary for us to have the best information available to stop the spread of HIV/AIDS. Kentucky has a high number of people infected with the disease that report unknown risk factors. If we do not have accurate numbers for who is being infected and what their behavioral risk factors are, we do not have a clear picture of where we need to target our prevention dollars." Edelen continued: "House Bill 350 does a disservice to the citizens of the Commonwealth of Kentucky by lowering healthcare standards for service providers and should be defeated. The citizens of this great Commonwealth deserve the best representation from their lawmakers to ensure the quality of healthcare is held to a higher standard than ‘minimum’ and enforced with every protection under the law." House Bill 118 passed the Kentucky House of Representatives and was sent to the Kentucky Senate on January 28, 2009. "We need a sign from the Republican Party of Kentucky that they will at a minimum listen to our concerns," stated Kentucky Equality Federation President Jordan Palmer. "Year after year we have a rally in the Kentucky Capitol Rotunda and though it receives some media attention, it doesn't bring us any closer to any of our goals." House Bill 118 seeks to: Create a new section of KRS Chapter 216B to allow a patient of a health facility who is 18 years of age or older to designate, in writing, an individual not legally related by marriage or blood, who the patient wishes to have visitation rights; require the health facility to note this designation in the patient's permanent medical records; provide that the patient may rescind the designation at any time, in writing. Palmer continued: "I have exchanged emails with Representative Kelly Flood, a sponsor of the bill, and we personally thank Representative Tom Burch, Chairman of the House Standing Committee on Health and Welfare, the entire Committee, and especially the sponsors such as Representative Mary Lou Marzian, Representative Kelly Flood, Representative Joni L. Jenkins, Representative Reginald Meeks, Representative Darryl T. Owens, Representative Ruth Ann Palumbo, Representative Arnold Simpson, and Representative Susan Westrom for sponsoring the bill." Palmer continued: "I think Senate President David L. Williams has a very unique opportunity with this bill to show the LGBTI community that Kentucky’s Republican Party does not consider us second-class citizens as it has appeared in the past. This bill isn't part of any "gay agenda," and I cannot imagine why conservative citizens would consider it a threat. This bill would benefit heterosexual couples as much as it would homosexual couples." Rick Wolfe, Special Adviser to the President for Discrimination and Youth Outreach stated: "Not only is it a chance for the LBGTI community to be recognized in the Commonwealth, but an opportunity for the Republican Party of Kentucky to recognize that there are diverse families in Kentucky. This is the first step in many to let our entire country know that we Kentuckians show compassion with each other. The passing of House Bill 118 would also send a much needed, positive message to youthful constituents (both LGBTI and our allies)." Richard Jones, part of the Office of the President and a member of the Discrimination, Hate Crimes, and School Bullying Committee stated, "Kentucky's gay and lesbian (LGBTI) community is so dissatisfied with Republican Leadership in both chambers that there is no longer a Log Cabin Republican Chapter in Kentucky to represent LGBTI Republican's which is truly sad because you can in fact be LGBTI and Republican, I know many of them. Like the Stonewall Democrats do with the Democratic Party, the Log Cabin Republicans are the voice of LGBTI people within the Republican Party." Palmer continued, "I hope that if this passes the Senate, it will establish a positive dialogue with the Republican Party of Kentucky. I know many Republican LGBTI citizens in Kentucky, but the majority are either Democrats, Stonewall Democrats, or members of the Libertarian Party of Kentucky. Ken Moellman, Chairman of the Libertarian Party of Kentucky has been a wonderful ally to Kentucky Equality Federation, and LGBTI citizens only vote to place people in office that will at a minimum hear our concerns." Dean Byrd, Kentucky Equality Federation's Board Secretary and Treasurer added, "Debates and disagreements are one of the things that makes our Commonwealth and our Union great; unfortunately, the Republican Party of Kentucky has completely alienated the LGBTI community and will continue to do so until they signal that they will at least hear our voice." 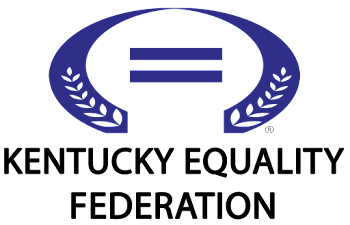 As the Commonwealth's largest all-volunteer grassroots organization, the President of the organization is a member of the Board of Directors but may only vote to break ties. In addition, the President is encouraged not to act without first consulting his Special Assistant, Richard Jones, and his veteran Special Adviser, Rick Wolfe. Both Jones and Wolfe are also members of the Federation's Discrimination, Hate Crimes, and School Bullying Committee.